In my previous post “Freeview Aerial Direction” you may have noticed something unusual about my Yagi TV antenna/aerial. Yes, amongst the array of directors in front of the dipole and on the reflector at the back there are some Zip Ties (Cable Ties – often used for anchoring a cable to something else). In this case their purpose is to prevent birds from landing on my aerial. The problem I have is that when they take off they tend to deposit their droppings on my solar panels and so reduce their efficiency. 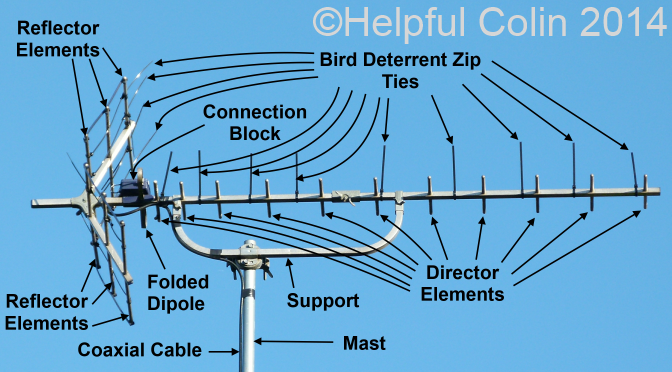 So this post describes a simple method of keeping birds off TV aerials. I asked my aerial erector if he could do something about it. He told me I could pay for some specific spikes to be fitted to my aerial or he would happily attach some zip ties for no extra cost if I had them to hand. I gave him a bunch and the result is shown in the featured image. In between the directors they are fixed to square tubing so they don’t rotate under gravity to point downwards. On the reflector where some round bar is used they are left long and threaded through to stop them moving out of place. Being plastic (an electrical insulator) they have no effect on the signal. Zip ties are commonly available in DIY and electrical stores. I used black ones because they are usually more resistant to UV (ultra-violet) light. It’s now April 2014 and I have to advise that a wood pigeon has been seen perched in the centre of my aerial. It neatly fitted itself between two zip ties. If I could do it again I would increase the number if zip ties and have them closer together. Yes very good Idea, I have the exact same problem, just had my solar panels fitted and 1 of my panels is getting hammered, top tip would be to use UV stabilized cable ties though as normal ones can crack in high UV. Your right to consider UV. When I worked for a well known Telecoms Co. I understood that external cable (polythene cable at least) was black due to the introduction of carbon. This made it robust under UV and other external conditions. Other colours were not seen as suitable for external use. I’ve always applied this concept to other plastics although it might not be correct. When I have used white cable ties outdoors they certainly have deteriorated but the black ones have survived. I look at my aerial and think it ought to have more ties on it since there seems to be at least one place still where a bird could settle but generally I am not having the problem I originally had. Next Next post: How Many Parts Make A Shower Head?